Convicted Felon William J. Postmus, former San Bernardino County Supervisor and Assessor, has been discovered by The IE Voice/Black Voice News to be allegedly linked to large campaign contributions to Hesperia City Council Member Paul Russ and loans to Hesperia City Council Member Rebekah Swanson—the contributions and loans were made through Mountain States Consulting Group, LLC. The political activity conducted by Mountain States Consulting Group, LLC caught the attention of the California Fair Political Practices Commission (FPPC) when two Hesperia residents filed complaints and the FPPC opened an investigation on February 7, 2017, referenced as #2017-00082. Additionally, the FPPC opened investigations into the campaign reporting of Hesperia City Council Member Paul Russ’s campaign for San Bernardino County Supervisor in 2016 referenced as File no. 16/374 and Bill Holland’s campaign for San Bernardino County Supervisor in 2016 referenced as File no. 16/375—both investigations were opened September 2, 2016. The inability to confirm the legal filing for Mountain States Consulting Group, LLC with the California, Nevada or Delaware Secretary of States and discovery that the address provided to the campaign of Hesperia City Council Member Rebekah Swanson was actually a UPS Store at the Victorville Mall, led to speculation that this could be alleged campaign money laundering. Campaign money laundering is where someone makes campaign contributions in a name other than the name by which such person is identified for legal purposes. This is a violation of California Government Code Section 84301 and is classified as a misdemeanor. A recent national search of limited liability companies located Mountain States Consulting Group, LLC, as a Wyoming limited liability company with William J. Postmus as a member. Postmus was awaiting sentencing after cooperating and providing testimony for the criminal trial of developer Jeffrey Burum, former San Bernardino County Supervisor Paul Biane, former San Bernardino Assistant County Assessor and Sheriff’s Labor Union President James Erwin and the former top aide for former San Bernardino County Supervisor Gary Ovitt, Mark Kirk. On August 28, 2017, after viewing evidence and hearing testimony, including the testimony of Postmus, two juries found all defendants not guilty of the charges. Now Burum, his business, Colonies Partners, LP, Erwin and Kirk are suing San Bernardino County and the San Bernardino County District Attorney for millions of dollars and Postmus will seek to withdraw his guilty plea at a November 2nd hearing. According to news reports, he will claim that he was addicted to drugs, under duress and coerced by investigators to enter the guilty plea. Postmus, through his membership position in Mountain States Consulting Group, LLC purportedly funneled $3,300 in loans to Rebekah Swanson for her Hesperia City Council 2016 Committee and $5,000 in contributions to the Russ for Supervisor 2016 Committee. Additionally, Jeremiah Brosowski, appointed to the Hesperia City Council on July 11, 2018, to replace Russ Blewett after his passing, has ties to Mountain States Consulting Group, LLC. Brosowski reported receiving somewhere between $10,000 and $100,000 from Mountain States Consulting Group, LLC—it was listed as a source of income on Brosowski’s Economic Interest Statement along with Tony Strickland Consulting, Inc.
Former California State Senator Tony Strickland, a Senior Consultant of MJ Real Estate Investors, is no stranger to FPPC as reported by the Los Angeles Times. In 2016, Strickland was accused of 16 violations of campaign finance law, including political money laundering and the filing of false statements. In May 2016, Strickland agreed to pay a $40,000 fine. In an October 18, press release announcing FPPC enforcement actions, Rebekah Swanson, as the treasurer for her husband’s campaign for Hesperia School Board, failed to timely file five semi-annual campaign statements. The FPPC and Swanson reached a “streamline settlement” where Swanson agreed to pay a fine of $1,045. Returning to Mountain States Consulting Group, LLC, Mountain States Consulting Group reported their address as Mall Blvd, Ste. 188, Victorville, CA 92392-7665, a post office box at a UPS store at the Victorville Mall, when the entity is really located in Wyoming. The funneling of money from an entity purportedly controlled by convicted felon Postmus to campaigns in the City of Hesperia where its city council is considering a number of large development projects—most specifically, the controversial Tapestry Project in Summit Valley—has Hesperia Resident Al Vogler speculating the developers are seeking to control the Hesperia City Council, the Hesperia Recreation and Park District and the Hesperia Unified School District in order to obtain waivers of normal development requirements. Vogler questions the sources of the substantial amount of campaign money flowing into the campaigns for City Council, the questionable appointment of Jeremiah Brosowski, the evasiveness of city council members when questioned about Jeremiah Brosowski’s appointment, the alleged recent bullying of City of Hesperia employees, and the close ties some of the city council members have with development and marijuana interests. When he attended the July 11 City of Hesperia City Council meeting where Brosowski was appointed, Vogler confirmed he heard from witnesses who were in the lobby they observed developer Dino DeFazio, Ghulam Farooq who has ties to the marijuana industry and possibly, former Hesperia City Council Member Bill Jenson speaking with Brosowski prior his being questioned by the City Council in consideration of his appointment. 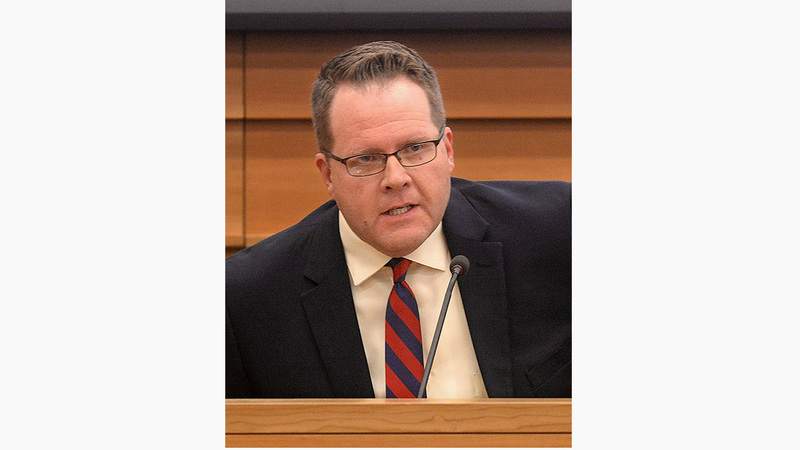 After hearing from other applicants who were there seeking to fill Blewett’s vacant city council position, Council Member Paul Russ then nominated Brosowski and Rebekah Swanson seconded the nomination. Vogler suspects DeFazio, Farooq and possibly Jenson provided the questions and advice to Brosowski in advance and in doing so, gave him an advantage over the other applicants. Vogler then requested the July 11 video footage from the security cameras located in the lobby to confirm the information provided to him by his sources. The City of Hesperia claimed the security footage is recorded over within 48-hours in an endless loop thus making the footage from July 11, unattainable. Then Vogler attended three subsequent meetings of the Hesperia City Council and questioned the suspect appointment of Brosowski. He received no answers to his questions at two of the meetings and one generalized response at another, however most of his questions remain unanswered. Volger also questions whether Postmus’ alleged campaign contributions/loans made through Mountain States Consulting Group, LLC. in violation of California Government Code is a violation of the terms of Postmus’ plea agreement, which includes provisions requiring Postmus not to violate any laws? The IE Voice/Black Voice News posed questions and requested comment from Hesperia City Council Members Paul Russ, Rebekah Swanson and Jeremiah Brosowski. They had not responded by the deadline.